The first statement was directed at a woman; the second was spoken by a woman. I’ve never heard it applied to men but I’ve heard it declared to woman many times. Sometimes by other women. Some actually believe it and use it to limit their motorcycle or touring choices. Why put up arbitrary barriers to limit your experience? Using your power isn’t limited to the physical. Apply it to making wise choices instead. While it’s true that purchasing a motorcycle beyond your skill level is a recipe for disaster, how did being able to pick it up ever become part of the decision? 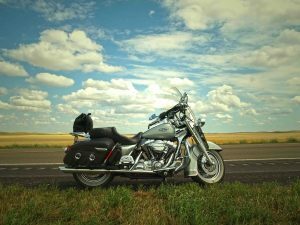 Most riders cannot right their motorcycle alone. Why not focus on riding the bike that’s best for you, then honing your skills, thereby reducing the chances of dropping it? Motorcycles tip over. Regularly. My blog post 10 Things to Do with a Dropped Motorcycle outperforms most other articles daily, and it was posted five years ago. Is it a good thing to be able to pick it up alone? Absolutely. Especially if you ride solo. Harley-Davidson made it a core topic at Garage Parties hosted by dealers across Canada and the U.S. for years. I attended many of them and demonstrated how to lift a big bike. Clinton Smout, of SMART Adventures shows fantastic methods for righting bikes. Easily applied to street riding, he adds techniques for off-road riders who are more likely to go over, sometimes in remote or precarious situations, like on a hill. Learning how to do it by yourself is a wise investment. So is having a contingency plan. While the first option is to enlist assistance, knowing the techniques will help you avoid injury or damage, even with help. Depending on how she’s fallen, I can no longer pick up Trudy. She’s tipped over twice—once in my garage when I was turning her around and lost traction on the cement floor; the other time after a long day of riding. After checking in to a motel, I was getting on to ride to my room. In my exuberance to be done for the day, I overexerted myself getting her off the side stand and we went over on her right side. The first time I called a friend for help; the second, I conscripted other riders who were staying at the same place. At one time I could lift my bike. I could also hoist it onto the center stand alone to change the oil and clean, lubricate, and adjust the drive chain. Now I require assistance for both tasks. I’ve had to really swallow my pride and ask for help. It’s not going to stop me from riding though. Nor has it influenced my choice of motorcycle. My 800 cc Triumph Tiger is the best bike for me and the type of riding I enjoy. I haven’t given up on being able to lift her alone, but in the mean time, I’ll figure out other ways. Asking for help requires a big dose of humility, something I’ve had to learn repeatedly over the past three years. Not only is it a gift to receive help from someone else, it’s a gift for the other person to bestow it. Instead of believing a disempowering motorcycle myth, change your perspective. Take control, make wise choices, and ride safely. Then enjoy the gifts! What’s your opinion—myth or truth? Why? Tell us in the comments. Excellent article, Liz, for both men and women. Exactly!! And it doesn’t stop you from riding does it! Thanks Norm. No it doesn’t stop me at all. My wife and I just got back from a 4 day trip to Wawa and back. It’s good to know that if we had to, we can pick it up together. I know that from mishaps in parking lots. Knowing how to do it is essential, to address situations like you described. Being able to do it single-handedly is not. I totally agree with you! Even if you can lift your motorcycle… it doesn’t always fall in the most perfect conditions. If it’s raining or on gravel or on it’s side in a ditch I don’t know of anyone that won’t have to ask for help. You are so right! It’s a total myth! Thank you for your great articles… keep them coming! Great artile Liz. Dead on and well explained. So many myths like this need to be put to rest. We (Women Riders) talk about empowering other women riders all the time. The “sisterhood”. So why not just help a sister pick up their bike…instead of creating another non-issue for new riders, or riders who are riding further alone, to worry about. often interesting things happen. There are a lot of good people in this world. So true! That’s MOST people! Thanks Steve. Fantastic! Thanks for this 🙂 My initial response when reading that was “What?! Guys *say* that?! When motorcycle safety courses, guides, etc., say to do a two-person life with heavy bikes? !” Then I got to your comment “Most riders cannot right their motorcycle alone.” And I cheered 🙂 Yeah, trying to lift it yourself is signing up for a hernia or worse. Anyway, that was my argumentative, anti-macho, guard-dog response. The rest of your post really gets to the heart of the matter and takes a wonderful high-road by reframing the whole discussion in the context of positive giving and receiving, shaming the myth completely off the map. I just started riding and I never had thought about picking up my bike my myself after a spill. I’m always with someone else when I’m riding and I figured the two of us could help each other pick up either bike. I don’t have a problem asking for help anyway. Is it something men have a problem with? (rhetorical) It is always good to get man made myths out in the open.Thanks for the article. Always good to question what we assume is fact. Thanks Joan.